"The game isn'tÂ MinecraftÂ on the Xbox, it isÂ Minecraft: Xbox 360 Edition, so it isn't really a direct port of the PC game." So says Paddy Burns, co-founder of 4J studios. The next update for the Xbox 360 version of Minecraft put the game roughly on par with Beta version 1.7.3 of its bigger, PC-based sibling. After that, there's a fairly large jump to version 1.8, The Adventure Update, which added a ton of new content to the PC version, including new materials, a food system and of course, the goddamn Endermen. Owners of the Xbox 360 version shouldn't expect all of those features, however. "There are no big architecture changes with the move to 1.7.3, so it's been quite straightforward. The move to 1.8.2 is much more challenging," Burns told OXM. 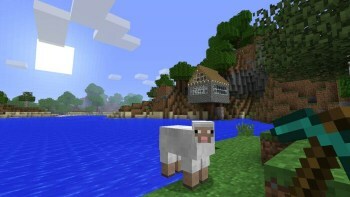 "We are working with Daniel Kaplan at Mojang to define what is going in to the Xbox version, but the aim is to include as many of the PC features that make sense on the Xbox as possible. The game isn'tÂ MinecraftÂ on the Xbox, it isÂ Minecraft: Xbox 360 Edition, so it isn't really a direct port of the PC game." Now, that last sentence is a little worrying. 4J has already run into trouble getting the Xbox 360 version to match its PC counterpart. World sizes in the PC version of the game are, for practical purposes, infinite, whereas the Xbox 360 version limits worlds to 1024 x 1024 blocks. While that restriction may be loosened, there's always going to be restrictions on world size due to the 360's hardware. On the other hand: splitscreen.